Yesterday alone the Islamouth & Glendelvine beats had 9 perfect springers between them which again is not surprising given the sheer astute professionalism of the ghillies involved in the 'consistent' daily fishing operation of these fine River Tay salmon beats. The remarkable aspect of what's been happening on the Tay this year is that the heavyweight salmon are back in town and most days salmon in the 20lbs class are being landed. It's getting to a point now since the Tay opened in mid January that an 18 pounder is again being regarded as a mere tiddler! The weight of these salmon is clearly all to do with salmon oceanic feeding cycles but some things in life are best left well alone. Knowing too much information about these mysterious and highly valuable creatures has only ever resulted in additional exploitation at sea and any data that 'blows their cover' in the name of 'scientific research' is potentially dangerous material if (& when) it gets into the wrong hands. Trying to overly investigate these fish at sea is truly as difficult as trying to find a field mouse that's disappeared into a giant hay stack! I firmly believe that any further money raised for oceanic research shouldn't be squandered on trying to stare into the abyss of the Atlantic Ocean but invested into obtaining satellite information and policing commercial fishing vessels that are operating in obvious salmon flight paths between our rivers and the salmon feeding grounds with investment also into 'wild' smolt ranching infrastructure. I remember the 'outcry' from some of the old team River Tay salmon fishers who'd been killing salmon all their lives (as many of us had done) who vowed they'd never fish the Tay again if they couldn't continue to kill salmon. All of us have missed the taste of these fine fish over the last decade since 'catch & release' was taken more seriously but missing the taste of a fish is nothing compared to permanently missing the tug on the fly reel which is where the Spring run on the Tay appeared to be heading just over 10 years ago. Now we've got consistency back in the game which clearly the 'catch & release' policy has assisted with wouldn't it now be wise to see if we can get the consistency back into our Summer & Autumn salmon runs again too. 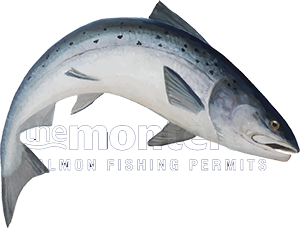 The new 'catch & release' Scottish law makes me laugh a bit as do they really think that the early Spring run leaves the river on the above date when the law of a 'mandatory' release ends meaning a salmon can be legally killed even if the river board rules 'recommend' that they aren't. If you're going to go 'catch & release' then don't play at it as there's enough basic common sense 'logic' that it helps stock positions on any river when Mother Nature permits a good spawning season. Thank goodness the vast majority of anglers are responsible but we shouldn't underestimate the value of any spawning salmon these days and if a salmon gets chapped logically there's zero chance of that fish ever contributing to future stock levels. Personally I think the Tay management should push for a full season all fish 'release' law for 'additional' Spring stock protection and for the chance that the Tay's Summer & Autumn runs also 'mysteriously' become more consistent again too!